In Tintin in America (1932), Tintin confirms his reputation as a righter of wrongs. He faces Al Capone and his gang as well as all sorts of other villains. Hergé shows his generous vision of the world as he offers a very well documented depiction of the sad plight of the Native Americans. Tintin's fame extends beyond the Atlantic Ocean, so, when he arrives in Chicago in the middle of Prohibition, all the gangsters in the city have gathered to make sure that he gets the most uncomfortable reception. Tintin will need to use all his determination and intelligence to survive! Tintin in America is the highest-selling Tintin title of all time. It is the clear winner ahead of Tintin in the Congo and Explorers on the Moon, which come in second and third places respectively. Tintin books have not always looked like they do today. At the beginning of Hergé's career, The Adventures of Tintin were published with a variety of different covers. The first edition of Tintin in America rolled off the printing press in 1932. The cover picture showed Tintin sitting on a rock while Red Indians creep up behind him, and the original Indian ink and gouache drawing was recently sold in auction for an astronomical price. The book was titled Les Aventures de Tintin, reporter du Petit "Vingtième" in America. 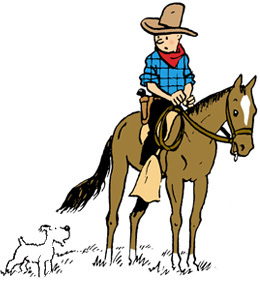 In November 1937, the adventure was published under a new cover adorned with a small picture showing Tintin riding a horse. The publisher's name, Casterman, (which was already printed in the 1935 edition) is also mentioned in this copy. Tintin in America. Tintin in America is one of the nine stories that were first published in black and white. From the ten years between 1932 and 1942, eleven editions of the book were produced. It is also the last story which was published under the Le Petit "Vingtième" label. During this period, more than 150,000 black and white Tintin books were printed, bound, distributed and sold. The book was also reworked in 1945, when Hergé began reformatting his black and white stories to create colour versions. In the new version, which appeared in 1946, many improvements were made to the illustrations. For the background to Tintin in America, Hergé was influenced by lectures he attended and also particularly by Georges Duhamel's book Scènes de la vie future (1930), which was openly and vehemently critical against the American lifestyle, sweeping modernisation, Taylorism, assembly line manufacturing and mass-marketing. To accurately portray life in the USA at the time the story is set, Hergé also turned to Le Crapouillot magazine, which had published a special edition devoted to the United States. "Nowhere does Hergé's art give such a strong impression of being directly influenced by the cinema than in the pages of Tintin in America"
Hergé made use of diverse techniques to mimic camera effects, as a way of developing the "final edit" frame by frame. Wonderful examples of this method can be seen on page 76. (Left: Chronologie d'une œuvre, Ph. Goddin, T2, p 83) or on page 81, in the sequence where the rea-der sees what Tintin is una-ware of: the bandit's hand grabbing a bottle. "Slift, the food factory, is a thinly-disguised reference to the real-life factories Swift & Co", which were automated production plants located in Chicago, involved in the meat industry. "The abattoir and cannery were already using automated processing machines, some of which were not at all unlike the machine in Tintin in America, where living cattle goes in one end and sausages come out of the other." Al Capone is the only real-life character in Tintin's adventures to have been drawn into the story under his real name. In fact, Al Capone's name had already been mentioned in Tintin in the Congo, as the head of an international diamond smuggling ring. This second adventure leaves no doubt that Chicago is going to be the little reporter's next port of call. The new environment is also Al Capone's hometown, in which the gangster and his cronies rule over every imaginable illegal market. In the October 1930 issue of Le Crapouillot, dedicated to the USA, a picture of Alphonse "Scarface" Capone makes the gangster look more like a popular Italian opera singer than public enemy number 1. This character is the archetypal evil mastermind, and Tintin's archenemy. He first appears at a banquet given in Tintin's honour, in Tintin in America, even though he is not mentioned by name. Roberto Rastapopoulos, officially a movie mogul, can be seen sitting among guests including (in the first edition of the story) Mary Pikefort, a thinly veiled Mary Pickford (a famous Hollywood actress from the 1920s).